Traversing between the Venetian Lagoon, Bianco Canal, and Po River, La Bella Vita offers authentic insight into the many Italian cultures — Roman, Etruscan, Istrian, Byzantine, and, of course, Renaissance — all of which have influenced the arts, architecture, and history of the region since the 10th century. More than just a series of charming canals and water taxis, the sightseeing portion of the cruise in Venice ensures La Bella Vita’s guests the opportunity to explore significant sights and offbeat gems within this culturally rich city. Once the cruise itself begins, La Bella Vita meanders through the Po River Valley, where small fishing villages remain untouched from their beginnings centuries ago. From here, guests are introduced to dynamic local personalities and area attractions via daily guided sightseeing, providing an insider’s view into the authentic culture of the River Po. Note that she cruises on a petite river as opposed to a manmade canal, so biking opportunities as not as plentiful compared to canal cruising. Back on board, the ten cozy cabins are decorated in lush shades of Venetian red and Byzanine blue, with clever storage space throughout. A spacious salon and dining area ensures ample room during the nightly cocktail hour, at which a different mixed drink is served. A highlight of La Bella Vita’s amenities is the expansive deck, where guests can relax with a glass of regionally produced wine, watching the river’s islands, villages, and bridges gently float by. Cuisine touches on an array of local specialties: pastas, cheeses, fish, and desserts, while wine pairings highlight both known and emerging Italian vineyards. An exclusive “Opera Evening” features an onboard performance of arias composed by Rossini, Puccini, and Verdi, furthering the intimate Italian immersion. In the afternoon, you will be met by a crew member of La Bella Vita at the designated meeting point in Venice. From here, relax as you are chauffeured to the barge. Enjoy a traditional Prosecco welcome and introduction to the crew. La Bella Vita then embarks on a cruise to the heart of Venice for a private tour of the Doges Palace. Representing the splendor of the Venetian Republic, its magnificent throne rooms and gorgeous gilded frescoes await. Return to the barge for cocktail hour and dinner. This morning, your Tour Guide introduces the city’s authentic streets, neighborhoods, and gardens. Local culture beckons at Palladio’s Church of San Pietro, as well as at the Naval Museum's collection of antique gondolas. An afternoon cruise to the tranquil island of Pellestrina floats past traditional islands in the Venetian lagoon and their ancient monasteries, fishing boats, and tiny churches. Once at Pellestrina, take a stroll or cycle to the 18th century seawall. Meanwhile, Chef is preparing another gourmet dinner – Mangia! Cruise this morning to the fishing port of Chioggia. Visit the 18th century Church of San Domenico, then board a traditional boat for a tour of Chioggia’s canals. Back onboard La Bella Vita, the afternoon’s cruise glides through a nature reserve to tonight's mooring of Taglio di Po. Dinner this evening is hosted by the owners of the restored 17th century Villa Ca’Zen, a private stately home where Lord Byron stayed and there wrote some of his best poetry. Family heirlooms, literary history, and local lifestyles converge at Villa Ca’Zen. This morning, the boat arrives at the Bianco Canal and moors at Adria, an ancient Etruscan town with an Archaeological Museum. This afternoon, your Tour Guide drives you to the Bagnoli Estate, complete with delightful Renaissance gardens. The Villa Widmann Borletti on the estate boasts wine cellars dating from the 17th century, and, from that time, it has been supplying wine to Venetian society. Enjoy a tasting of these estate-grown vintages. Afterwards, rejoin La Bella Vita now moored at Zelo. Drinks and dinner onboard. The vibrant culture of the Italian Renaissance stars today in Ferarra at Palazzo Schifanoia, built as a pleasure palace by the Este family, and now renowned for twelve captivating frescoes in the Room of the Months. The 15th century images and colors seem as fresh today as when they were painted. Other period buildings in Ferrara include Estense Castle, as well as the magnificent cathedral with its façade of sculpted images described as an illustrated Bible. Return to the La Bella Vita for an afternoon cruise to Governolo and dinner onboard. 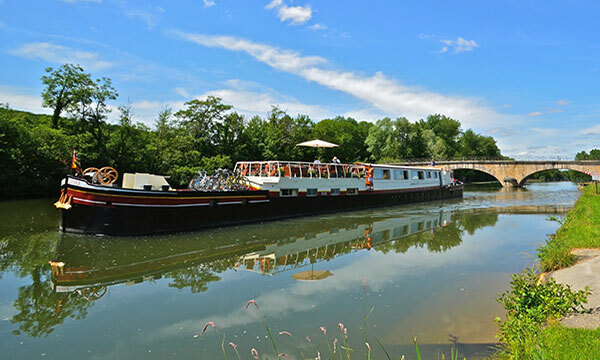 Our final cruise features a dramatic approach to Mantua in its captivating lakeside setting. Happily, Mantua's classic architecture and elegant ambiance remains undiscovered by tourist crowds. La Bella Vita guests will tour the 14th century Palazzo Ducale, the second largest residence in Italy after the Vatican. Most of its 500 rooms are closed, but 15 gardens, the Gallery of Mirrors, and a priceless collection of artworks can be seen. 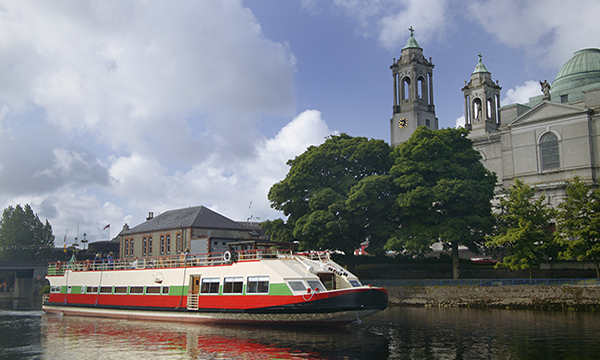 Then it's back to the barge, moored in the shadow of this fascinating destination, for the gala Captain’s Dinner. Bid “arrivederci” to La Bella Vita. After breakfast, you will be chauffeured to the designated drop off point in Venice. Attend the Opera in Verona Tonight! In the afternoon, you will be met by a crew member of La Bella Vita at the designated meeting point. From here, relax as you are chauffeured to your home for tonight, Hotel Due Torre in Verona. In Verona, we will visit the fascinating Arena Muse Opera, a wonderful museum in the magnificent setting of Palazzo Forti and devoted to the history of opera. There, we also have dinner in the delightful courtyard restaurant, before making our way to the nearby Arena di Verona, a Roman amphitheatre built in 30 A.D. where we watch a performance from our top-priced front stalls seats. At the end of a memorable evening, we drive back to the hotel in Padua. After breakfast in the hotel, we will depart back to Venice to board La Bella Vita for a Prosecco Welcome. After lunch, an afternoon cruise takes us along the Giudecca Canal past some of Venice’s most famous monuments: the Chiesa del Redentore, the impressive Basilica di Santa Maria della Salute and the Punta della Dogana to our mooring outside the Naval Museum. There is time for a stroll to St Mark’s Square and a brief tour of the Doge’s Palace before dinner on board. This morning, a guided tour of the magnificent opera house, the Gran Teatro La Fenice, pictured at right, where the premières of operas by composers such as Rossini and Verdi were performed. In the afternoon, we cruise to Pellestrina which separates the Venetian Lagoon from the Adriatic Sea, along the Canal of the Orphans, passing lagoon islands with their ancient monasteries, painted fishing boats and tiny churches. Enjoy a walk at sunset before dinner onboard. This morning we cruise to Adria, an ancient Etruscan town and visit the Archaeological Museum. After lunch on board, we drive to the Bagnoli Estate where we tour the Renaissance gardens and wine cellars of the 17th century Villa Widmann Borletti, for a private tasting of their renowned estate grown vintages. This winery has been supplying Venetian society for centuries. Afternoon cruise to Bosaro. Dinner onboard. Morning excursion with a guided tour of the Renaissance city of Ferrara. Here, we tour the Teatro Communale, built in the late 18th century and boasting a majestic 5-tiered auditorium. We also visit the ‘Camerino delle Duchesse’, a truly delightful private room in the Ducal Palace decorated in the 16th century for Eleonora and Lucrezia d’Este. We see the 14th century Estense Castle with its moat, drawbridges and marble balconies, the fabulous 15th century frescoes in the Schifanoia Palace and the cathedral façade with its sculpted images described as an illustrated Bible. Return to the hotel barge for an afternoon cruise past villages and farmsteads to Trevenzuolo and dinner onboard. Rigoletto’s House and a Theater where Mozart Performed! Our final cruise has a dramatic approach to Mantua, a Renaissance city with a captivating lakeside setting and home to Verdi’s opera Rigoletto. 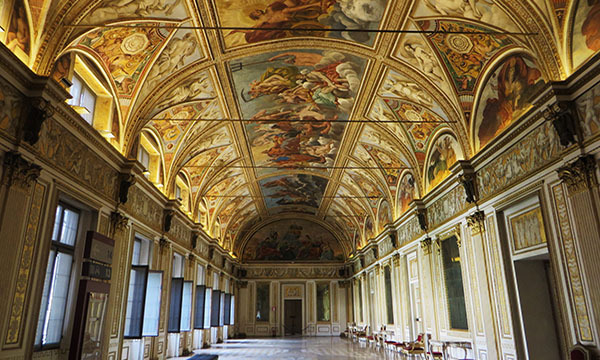 Mantua displays extraordinary neo-classical and baroque architecture, portrayed in the 14th century Ducal Palace housing some 15 gardens and courtyards, a museum, basilica, intricate frescoes, the Gallery of Mirrors and the exquisite Rivers Room. We explore the city further, finding “Rigoletto’s House” near the cathedral, then finally, we visit the intimate Teatro Bibiena, pictured at right, a delightful baroque theatre with a bell-shaped interior that opened with a concert by a 13-year-old Mozart in 1770. A wonderful finale to our opera adventure. Captain’s Farewell Dinner onboard. Bid “arrivederci” to La Bella Vita. After breakfast, you will be chauffeured to the designated drop off point.